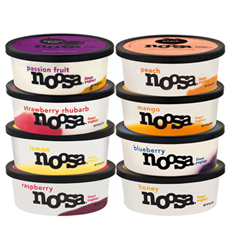 To start with, Noosa is yoghurt, not yogurt. That’s the Australian spelling, and appropriate for a brand that originated Down Under. The original Noosa is a picturesque Australian resort town on Queensland’s Sunshine Coast, the home of golden beaches. The name Noosa comes from an Aboriginal word meaning shade or shadows, a probable reference to the tall forests behind the sunny coast. On a vacation to Noosa, company co-founder Koel Thomae—an Aussie ex-pat living in Colorado—came across a tub of creamy yoghurt and passionfruit purée. It took just one spoonful for her to decide that she must bring this celestial style of yogurt to the U.S. Back in Colorado she found a partner, fourth-generation dairy farmer Rob Graves, who milked happy, pasture-raised cows. He took one taste of the Australian yogurt and agreed with Koel. America needed Noosa. The line is certified kosher (dairy) by OU, certified GMO free and made with rBGH-free milk from pastured cows. 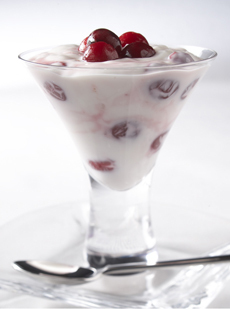 Noosa Yoghurt is so silky, it’s like an elegant dessert. Photo courtesy ChooseCherries.com. The four-ounce cups, for 140 calories or so, depending on the flavor, is a wonderful bit of fruity sweetness at the end of the meal, or as a snack anytime. And for breakfast or lunch, well: What a treat. It’s worth seeking out. Here’s a store locator and the main website. Scroll to the bottom of the home page for a link to print a coupon.